A drug similar to Ritalin, called Concentr8, has suddenly stopped being distributed and the repercussions are as Dr. Pyle expected: the withdrawal symptoms have led to riots and other antisocial behaviors. For years the London mayor and Dr. Pyle had been in on the scheme to subdue the undesirables of London by drugging them with behavioral modification drugs: social control at its best. Everyone had agreed to the plan—children would concentrate in school and were less troublesome, parents had fewer problems controlling their children, and teachers had their orderly classrooms back, and the streets seemed safer. Plus the government offered welfare incentives. No one bothered to question why any of these children were having problems in the first place. No one asked about their poverty, the sexual, physical, or mental abuses at home, the social expectations dumped on them that they only lived up to. This was a drug for the lower social stratum, and journalist Amanda Giotta has the story. Set in current day London, a group of teens watch the riots and sense their turn to rage. For too long they have been medicated, like so many others, from a young age. Blaze and his band of misfits have kidnapped a government worker and taken him to an abandoned warehouse. The feds find them quickly, but it takes six days for everything to reach a conclusion, and it is only once the mayor has negotiated, giving up his pride and coming to a deal with Blaze. Each chapter is told from a different perspective of one of the teenagers, and each chapter is marvelously told in a different voice and cadence. For instance, Karen uses upspeak—peppering her speech with questions that aren’t questions—and Lee speaks in fits and starts, circling around to a previous thought. This is a larger story than just teens who did something bad one day and who fend off the feds while their leader tries to figure his way out and each friend has to decide her or her level of loyalty. This is also the story of the government that let down an entire social group—Blaze, Femi, Karen, Troy, and Lee are the sample population. It is a shame that the opportunity to see into a parent’s viewpoint, such as Blaze’s mother’s, is passed up. 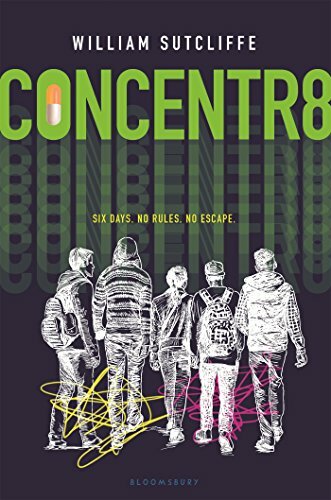 Though Concentr8 is marketed to young readers, its fans will be adults who recall the upswing in the prescription of Ritalin and the diagnoses of friends with ADHD. At the beginning of each chapter, author William Sutcliffe cites excerpts from journal articles, books, newspapers, interviews, and tweets about Ritalin and its effects as a basis of comparison for his fictional drug. Concentr8 is a social commentary about the over-medicalization of childhood in Western culture. The book lays the blame of the current problem of over-diagnosing real-world children, as well as those in this fictional world, with ADHD at the feet of governments and industries with doctors in their pockets. Concentr8 points out that these people, meant to be helping future citizens, are failing to ask critical questions, as are the parents. While some of the parents, as suggested by the fiction, are uneducated, others are too lazy or eager to find a solution that gives them a way out of helping change their children’s behavior. It’s the solution that takes the least amount of effort.